Detects the 121, 165 and 189 VEGF isoforms in routinely fixed specimens. BALB/C mice were injected with a recombinant VEGF protein. Please note that expression of VEGFA is low in most samples without treatment (e.g. hypoxia / DFX / CoCl2). Cell treatment with a Golgi inhibitor (e.g. brefeldin A) may enhance detection. Loading a high amount of sample (>50 µg) and addition of protease inhibitors (e.g. ab65621) may also enhance detection. Our Abpromise guarantee covers the use of ab1316 in the following tested applications. WB Use a concentration of 5 - 10 µg/ml. Please note in our hands this antibody is sensitive to blocking conditions. 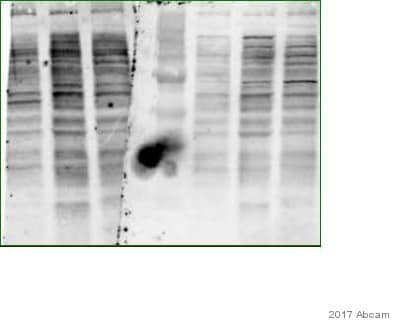 If you are seeing no bands on your western blot, we suggest using 3% milk for 1 hr at RT for blocking. For the primary antibody incubation step, we suggest 1 hr at RT rather than overnight at 4°C. We would also recommend incubating primary and secondary antibodies in TBST only. ICC Use a concentration of 10 µg/ml. See Abreview. Growth factor active in angiogenesis, vasculogenesis and endothelial cell growth. Induces endothelial cell proliferation, promotes cell migration, inhibits apoptosis and induces permeabilization of blood vessels. Binds to the FLT1/VEGFR1 and KDR/VEGFR2 receptors, heparan sulfate and heparin. NRP1/Neuropilin-1 binds isoforms VEGF-165 and VEGF-145. Isoform VEGF165B binds to KDR but does not activate downstream signaling pathways, does not activate angiogenesis and inhibits tumor growth. Isoform VEGF189, isoform VEGF165 and isoform VEGF121 are widely expressed. Isoform VEGF206 and isoform VEGF145 are not widely expressed. Defects in VEGFA are a cause of susceptibility to microvascular complications of diabetes type 1 (MVCD1) [MIM:603933]. These are pathological conditions that develop in numerous tissues and organs as a consequence of diabetes mellitus. They include diabetic retinopathy, diabetic nephropathy leading to end-stage renal disease, and diabetic neuropathy. Diabetic retinopathy remains the major cause of new-onset blindness among diabetic adults. It is characterized by vascular permeability and increased tissue ischemia and angiogenesis. Secreted. VEGF121 is acidic and freely secreted. VEGF165 is more basic, has heparin-binding properties and, although a signicant proportion remains cell-associated, most is freely secreted. VEGF189 is very basic, it is cell-associated after secretion and is bound avidly by heparin and the extracellular matrix, although it may be released as a soluble form by heparin, heparinase or plasmin. 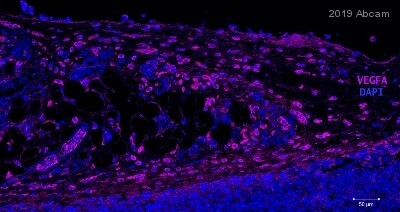 IHC image of ab1316 staining VEGF in human cerebellum formalin fixed paraffin embedded tissue sections, performed on a Leica Bond. The section was pre-treated using heat mediated antigen retrieval with sodium citrate buffer (pH6, epitope retrieval solution 1) for 20 mins. The section was then incubated with ab1316, 5μg/ml working concentration, for 15 mins at room temperature and detected using an HRP conjugated compact polymer system. DAB was used as the chromogen. The section was then counterstained with haematoxylin and mounted with DPX. No primary antibody was used in the secondary only control (shown on the inset). 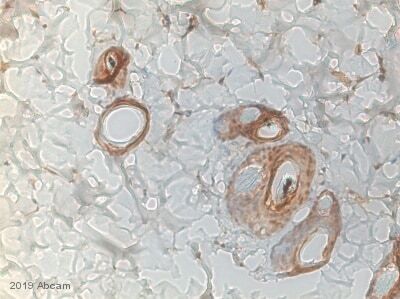 IHC image of ab1316 staining VEGF in rat cerebellum formalin fixed paraffin embedded tissue sections, performed on a Leica Bond. The section was pre-treated using heat mediated antigen retrieval with sodium citrate buffer (pH6, epitope retrieval solution 1) for 20 mins. The section was then incubated with ab1316, 5μg/ml working concentration, for 15 mins at room temperature and detected using an HRP conjugated compact polymer system. DAB was used as the chromogen. The section was then counterstained with haematoxylin and mounted with DPX. No primary antibody was used in the secondary only control (shown on the inset). 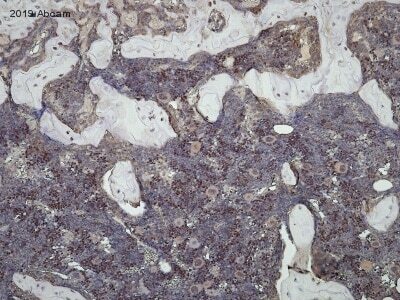 ab1316 staining VEGF in Human MDA-MD-231 cells injected into the mouse mammary fat pad by Immunohistochemistry (IHC-P - formaldehyde-fixed, paraffin-embedded sections). Tissue was fixed with paraformaldehyde, permeabilized with Tween in PBS and blocked with 1.5% serum for 1 hour at 25°C; antigen retrieval was by heat mediation in citrate buffer. Tissue samples were incubated with primary antibody (1/200 in PBST +1% BSA) for 16 hours at 4°C. 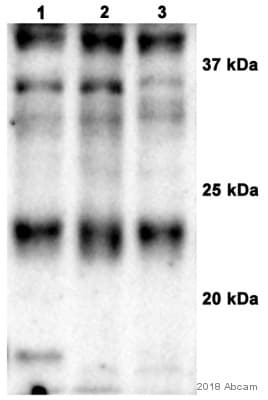 A biotin-conjugated Goat anti-mouse IgG polyclonal (1/200) was used as the secondary antibody. Tissue was counterstained with Hematoxylin (1/10) for 30 seconds at room temperature and rinsed with water. 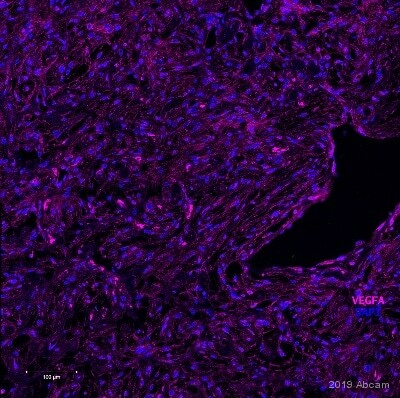 IHC image of ab1316 staining in human heart formalin fixed paraffin embedded tissue section, performed on a Leica BondTM system using the standard protocol F. The section was pre-treated using heat mediated antigen retrieval with sodium citrate buffer (pH6, epitope retrieval solution 1) for 20 mins. The section was then incubated with ab1316, 5µg/ml, for 15 mins at room temperature and detected using an HRP conjugated compact polymer system. DAB was used as the chromogen. The section was then counterstained with haematoxylin and mounted with DPX. ab1316 at 10µg/ml staining human retinal pigment epithelial cells. The antibody was incubated with the cells for 6 hours and then detected with Alexa-Fluor ® 568 goat anti-mouse (IgG) antibody. This image is courtesy of an Abreview submitted on 16 November 2005. ICC/IF image of ab1316 stained HeLa cells. The cells were 100% methanol fixed (5 min) and then incubated in 1%BSA / 10% normal goat serum / 0.3M glycine in 0.1% PBS-Tween for 1h to permeabilise the cells and block non-specific protein-protein interactions. The cells were then incubated with the antibody (ab1316, 10µg/ml) overnight at +4°C. The secondary antibody (green) was Alexa Fluor® 488 goat anti-mouse IgG (H+L) used at a 1/1000 dilution for 1h. Alexa Fluor® 594 WGA was used to label plasma membranes (red) at a 1/200 dilution for 1h. DAPI was used to stain the cell nuclei (blue) at a concentration of 1.43µM. 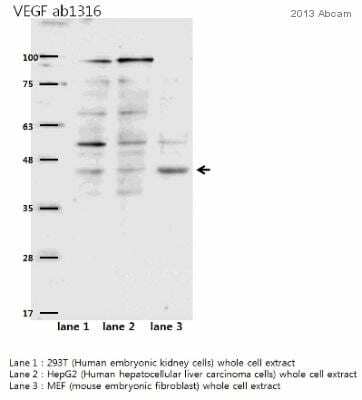 This antibody also gave a positive result in 100% methanol fixed (5 min) Hek293, HepG2 and MCF7 cells at 10µg/ml, and in 4% PFA fixed (10 min) HeLa, Hek293, HepG2 and MCF7 cells at 10µg/ml. This blot was produced using a 10% Bis-tris gel under the MES buffer system. The gel was run at 200V for 35 minutes before being transferred onto a Nitrocellulose membrane at 30V for 70 minutes. The membrane was then blocked for an hour using 3% Milk before being incubated with ab1316 overnight at 4°C. Antibody binding was detected using an anti-mouse antibody conjugated to HRP, and visualised using ECL development solution.